I’m sad to say that I am leaving the Statistically Speaking blog at MVN and excited to let you know that I will be joining the team of writers at The Hardball Times. I haven’t written any articles yet for THT, but I’ll let you know when I do. Note: This article was originally published at the Statistically Speaking blog at MVN.com on December 9, 2007. Since the MVN.com site is defunct and its articles are no longer available on the web, I am re-publishing the article here. In baseball analysis, oinking is boring. Everyone loves to marvel at singing pigs, particularly if maybe they thought a particular pig had a penchant for music in the first place. Rare is the analyst or reader who stops the party to tell us that pigs just say oink, and there’s something wrong with the analysis process that sold us into the thrall of a porcine melody. When it comes to PITCHf/x, the new toy of the sabermetric community–one that isn’t well-vetted or widely understood yet–we need to be especially careful about drawing superficial conclusions. It sounds great– it rang true with my preconceptions based on scouting reports that said Gagne didn’t have a very good slider, and the data showed he didn’t throw it very often, so Gagne himself appeared to agree with my conclusion. Strike up the band, the pigs are going to sing! There’s only one problem. In this case, John Walsh was the one who pointed out to me that pigs say oink. The slider’s x-z spin axis seems to be all over the place because the spin axis on Gagne’s slider is almost completely aligned with the y-direction, the direction of travel, with the ball spinning like a spiraling football pass. Whatever small component of the spin shows up in x- or z-directions is overwhelmed by errors in the measurements and subsequent calculations. Now I know to pay attention to this, thanks to John. I would like to encourage you all to be suspicious when you find something odd from the PITCHf/x data. Does John Smoltz throw a 92-mph slider? Maybe, or maybe the PITCHf/x system was measuring a little fast that day. 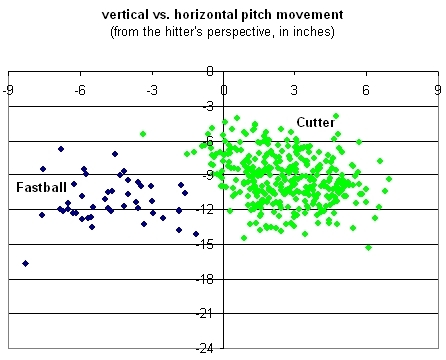 As I mentioned in my article about John Smoltz, I’ve recently been researching the slider. Looking at the slider naturally lends itself to examining its cousin, the cut fastball. In one sense, they’re completely different animals: one an off-speed pitch, a breaking ball; the other a fastball. That is true for some pitchers, whose sliders are classic breaking balls bearing little resemblance to a cutter. But for other pitchers they are more closely related, with sliders breaking very similarly to what might be called a cutter by someone else. In those cases, the main difference between a slider and a cutter is speed. The cutter is usually thrown almost as fast as a pitcher’s regular fastball, within a few miles per hour, and the slider is usually 5 mph or more slower than the fastball. Rather than quibbling too much over the theoretical definitions of sliders and cutters, let’s take a look at some real data. Today let’s examine the classic cut fastball and the pitcher who made it famous: New York Yankees closer Mariano Rivera. We have detailed PITCHf/x data for 399 of the 747 pitches that Rivera threw during the 2007 season, including three post-season appearances in the divisonal series against Cleveland. It wasn’t until 1997 that Rivera started toying with the grip on his fastball. He began immediately to evolve from a strikeout pitcher (he averaged almost 11 per nine innings in ’96 as setup man to Wetteland) to one who induces ground balls, thus improving his efficiency and making him available more often to Torre. Now he uses almost exclusively the cut fastball clocked in the mid-90s that seems much faster because he lulls hitters with a smooth delivery that explodes the ball in on hitters’ hands. Except for a couple mph lost on the fastball, the scouting report doesn’t seem to have changed that much in eight years since then. As expected, we see that Rivera throws almost 90% cutters. 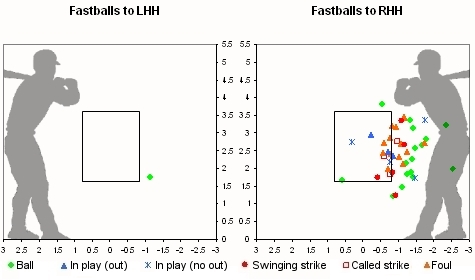 The remainder of the pitches appear to be regular fastballs. I read rumors of a slider in a scouting report here or there, but I don’t see any evidence of it in the data we have from 2007. Either people are confusing the movement of the cutter with a slider, or Rivera throws it so infrequently it didn’t show up in my data. How does the pitch movement look to the hitters? Both his fastball and cut fastball have hop due to the mid-90-mph speed, but they break in opposite directions. Here’s a graph of the pitch movement, including both aerodynamic (spin) effects and the effect of gravity. What does Mo Rivera do with these pitches? The first thing I noticed is that he throws his regular fastball almost exclusively to right-handed hitters. 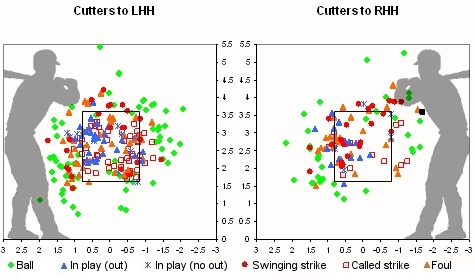 Lefties only see the cutter (with one exception in 223 pitches), but righties get 64% cutters and 36% regular fastballs. Lefties can’t deal with his cutter at all. They can’t put it in play very often, and when they do, it’s mostly ground balls on the infield. Let’s take a look at strike zone charts showing where Rivera locates his fastball and his cut fastball against left-handed and right-handed hitters. I’m keeping the same formatting for these charts as I did in my analysis of Joba Chamberlain, Josh Beckett, and Eric Gagne. 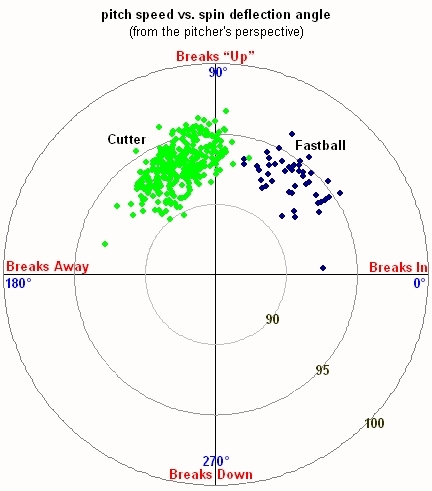 The strike zone is shown as a box, including one radius of a baseball on each side of the plate, and the top and bottom of the zone are a general average not adjusted per batter in these charts. The location is plotted where the pitch crossed the front of home plate. Rivera likes to bust his fastball inside against righties, and he gets quite a few foul balls that way. When the hitters did put it in play, they had fairly good results. Most of his fastballs were thrown early in the count, on 0-0, 1-0, or 1-1: 38% fastballs and 62% cutters on those three counts. On all other counts he threw 14% fastballs and 86% cutters to right-handers. Now, the cutter. Against lefties, he throws it both inside and outside. When he throws it inside, he gets a lot of ground ball outs, but anywhere he throws it he gets good results. Against righties, he mostly works away, but it looks like he’s also not afraid to come up and in. Righties swing and miss a lot against the cutter. I probably haven’t shown anybody anything terribly revolutionary about Mariano Rivera. You knew he was a very good pitcher who relied on a cut fastball before you read this article. But if I’m going to talk about the cutter, I have to start with the best in the business, and that’s Mo Rivera.